Biscottis are crunchy italian cookies. 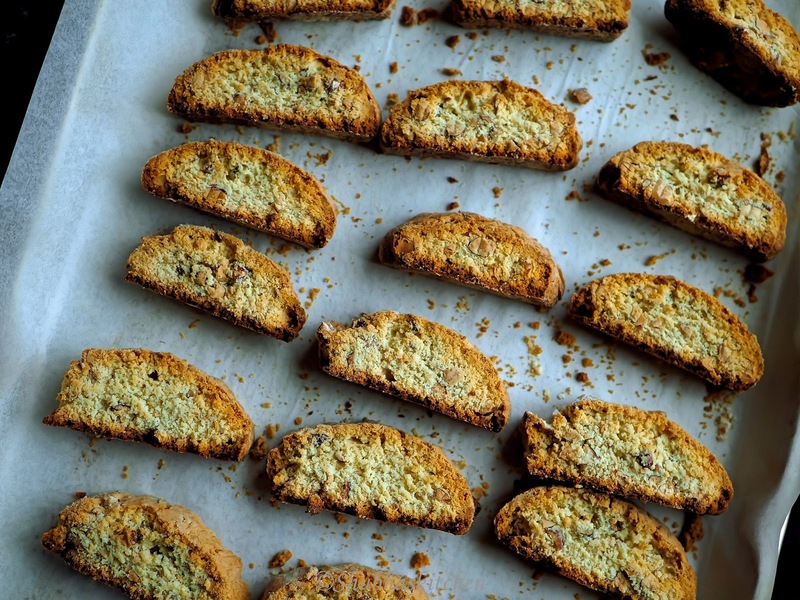 Biscotti is derived from the latin word "biscoctus" meaning twice baked. So as the name suggests preparation of this cooking involves two steps of baking. 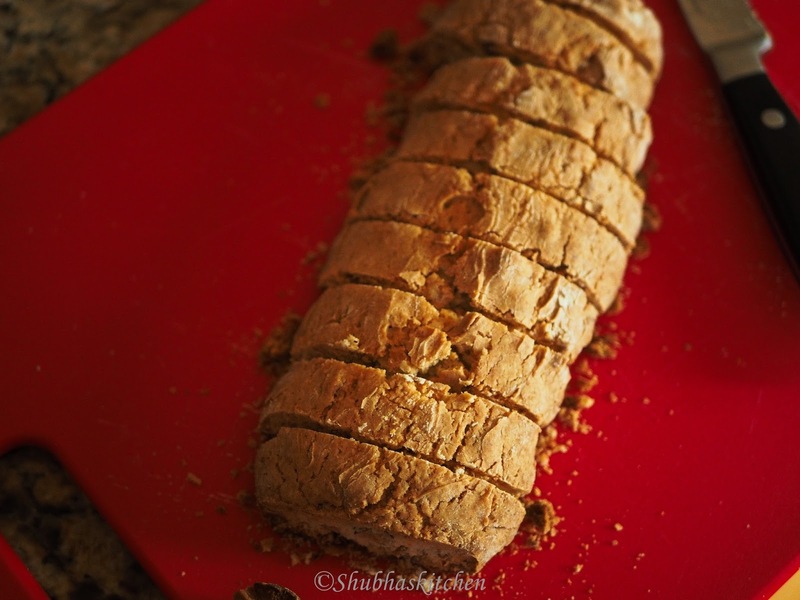 Ingredients are mixed, shaped into a log and baked. Then it is cut into pieces and baked again. 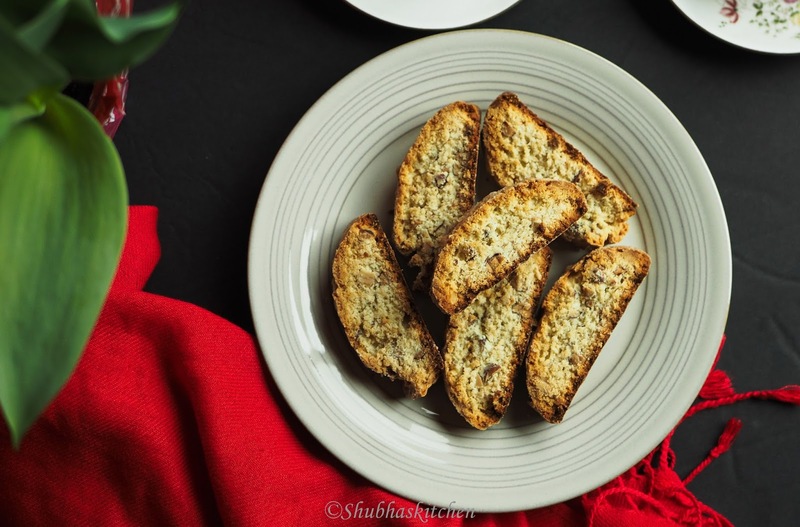 Today, I share with you all a simple and easy recipe for ALMOND BISCOTTI. 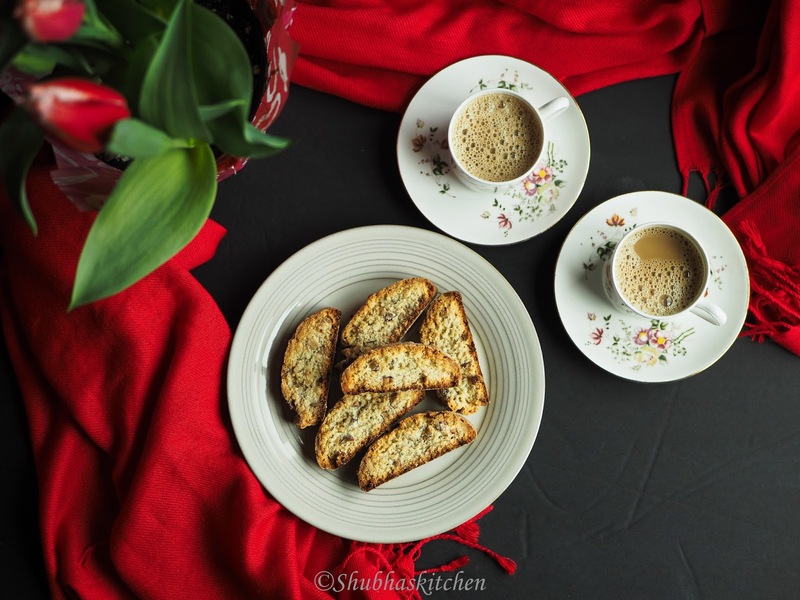 Biscotti is usually served with coffee. 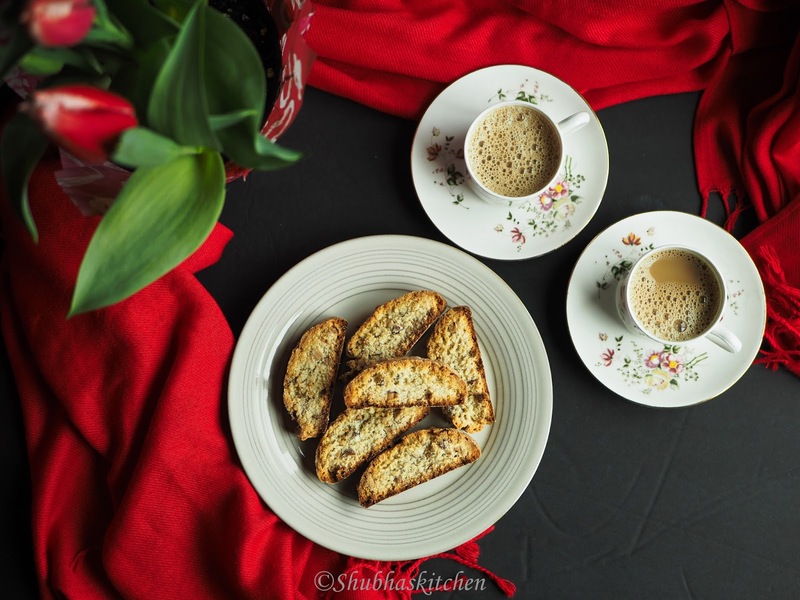 It is traditionally eaten by dunking / dipped it in the coffee and then eating. So for this reason, these cookies are made a little harder so that they retain their form even after being dipped in coffee. Preheat oven to 350 F. Place the shelf in the middle of the oven. Spread almonds in a baking sheet and toast them for 10 mins until they are toasted. Once done, let them cool down until ready to be handled. Chop them roughly into pieces. Set it aside. In a small mixing bowl, mix flour, baking powder and salt. Set it aside. In a separate bowl, mix eggs, vanilla extract and almond extract. In an electric mixer with a paddle attachment, beat the butter and sugar until well blended. Add the egg mixture and beat until creamy. Slowly add the flour mixture. Mix until well incorporated. Add the chopped almonds and mix until well combined. 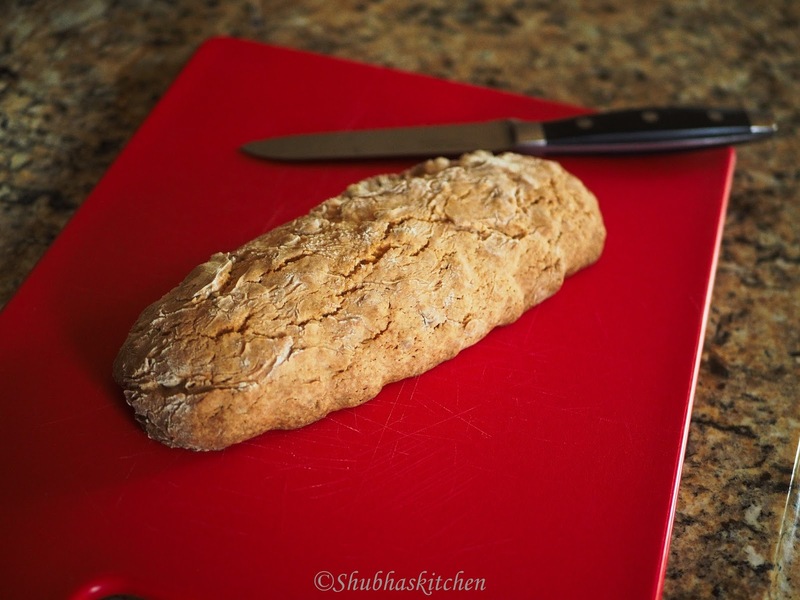 Dust the counter top or a cutting board with flour. Put the sticky dough (yes, the dough will be very sticky) in to the dusted board and divide the dough into 2 parts. Shape each part into a log that is 2 inch wide. 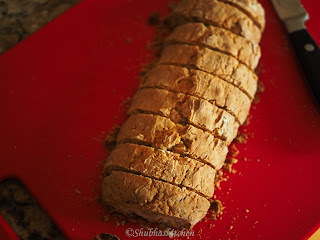 Keep the two logs in a baking sheet lined with parchment paper. Bake it in the oven preheated to 350 F for about 40 minutes (Baking time may vary from oven to oven). Remember to rotating the baking tray half way through the baking time. Bake until the log is slightly golden and firms up but still not too hard. (Remember we will be baking it again).Set it aside for 10 minutes. Once the logs have cooled down, using a serrated knife cut them into thick slices. Place these slices (with the cut side down) in a baking tray. Bake again in an oven preheated to 350 F for 8 minutes . Remove the tray, flip the cookies to the other side , rotate the tray and bake again for another 8 minutes. Once done, set it aside on the cooling rack to cool. Cookies will completely harden once cooled. Enjoy with the cup of coffee.